CANTON, Mass. (January 26, 2015) – This Valentine’s Day, Dunkin’ Donuts is putting a little extra “heart” into its menu by introducing the brand’s seasonal lineup of sweet heart treats. Just in time for the sweetest holiday of the year, Dunkin’ Donuts is bringing back two varieties of its beloved heart-shaped donuts, Cookie Dough and Brownie Batter, while introducing special new White Chocolate Raspberry Coffee and Lattes sure to warm any heart. Dunkin’ Donuts’ Brownie Batter Donut is a heart-shaped donut filled with delicious chocolatey brownie batter flavored buttercreme filling, topped with chocolate icing and heart sprinkles. The Cookie Dough Donut is a heart-shaped donut with cookie dough flavored buttercreme filling, topped with chocolate icing and chocolate chips. Both heart-shaped donuts are available at participating Dunkin’ Donuts restaurants nationwide through the end of February. 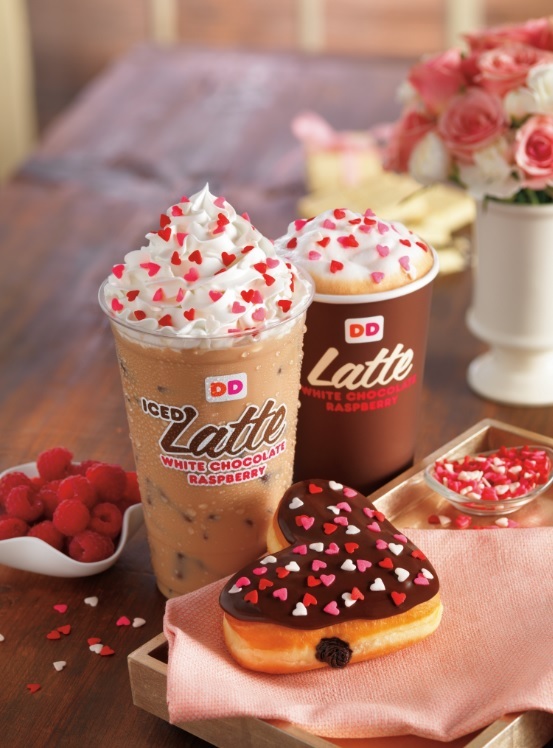 This Valentine’s Day, both coffee lovers and chocolate lovers can fall in love with Dunkin’ Donuts’ new White Chocolate Raspberry Coffee and Lattes. The rich flavor of white chocolate with the sweet and fruity raspberry flavor creates a combination that invokes the feelings of warmth and enjoyment associated with the holiday. For an extra festive and romantic touch, the White Chocolate Raspberry Lattes are sprinkled with a special red, pink and white hearts topping. Dunkin’ Donuts’ White Chocolate Raspberry Coffee and Lattes are available hot or iced at participating Dunkin’ Donuts restaurants through the end of February. Chocolate lovers can also enjoy a variety of hot chocolates at Dunkin’ Donuts for Valentine’s Day season, including flavors such as Salted Caramel Hot Chocolate, Original, Mint, S’mores and Dunkaccino®. To enjoy Dunkin’ Donuts’ classic hot chocolate at home, Dunkin’ Donuts’ Hot Cocoa K-Cup® Packs are also available for $8.99 at participating Dunkin’ Donuts nationwide. Dunkin’ Donuts today also announced the Snack N’ Go Chicken Wrap as a permanent addition to its lineup of sandwich selections. Offering guests big flavor in a snack-size version of Dunkin’ Donuts’ popular Breaded Chicken Sandwich, the new Snack N’ Go Chicken Wrap features half a filet of breaded chicken, a slice of white cheddar cheese, a slice of bacon and tasty ranch sauce, served on an oven-toasted tortilla. Snack N’ Go Chicken Wraps are available at participating Dunkin’ Donuts restaurants nationwide.